My Deal. No Deal. Delay. British Parliament sounds like a casino where all bets have gone wrong. Worse, uncertainty still rages—three years after the United Kingdom voted to leave the European Union. Brexit is delayed by two weeks… but maybe not. No one knows what will happen, even at this eleventh hour. Is Britain leaving the EU or not? Will Britain leave with a deal or no deal? Will Britain exit on April 12, May 22, a year, two years from now, never? May lobbed a grenade when she accused parliamentarians of “contemplating their navel”, playing “political games” and triggering a national crisis by rejecting her Brexit deal. Outraged MPs say May’s attack inflames public hatred against parliamentarians. Pro-Brexit hate-mongers call anti-Brexit MPs “traitors” who should be “beheaded”. Defence Minister Tobias Ellwood tweeted a menacing letter he received, vowing to “bring London to its f***ing knees”. Threats of intimidation, abuse and assault are so serious that Parliament’s Deputy Speaker Lindsay Hoyle urged MPs to go home together in groups or take taxis as “tensions and emotions are running at an all-time high”. Brexit has taken a huge toll on Britain. Tory MP Dominic Grieve fears his nation could “spiral into oblivion”. 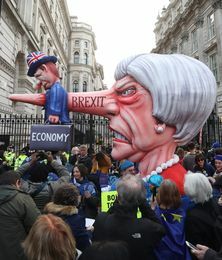 The leadership collapse, the political breakdown, party infighting, parliamentary chaos, public polarisation, cabinet revolts, dysfunction and uncertainties have left the UK weak, divided, confused, tired and humiliated. Through history, Britain has been envied, admired, respected, resented or reviled. But never pitied. This, too, has come to pass.